Representations of Holy Places from the land of Braj have been developed at Radha Madhav Dham for devotional inspiration and meditation. Significant holy places of Braj like Govardhan, Radha Kund, Prem Sarovar, Shyam Kuti, Man Mandir and Mor Kuti are represented in Radha Madhav Dham where the natural stream named Kalindi represents the Yamuna river of Vrindaban. 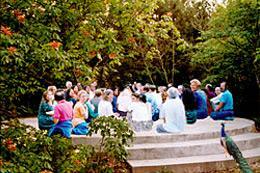 So local visitors and our guests from throughout the U.S. and around the world can visit Radha Madhav Dham and experience the peaceful and devotional atmosphere of Ashrams of Ancient India 5000 years ago. During the Ascension period, just 5,000 years ago, Radha Rani’s palace was situated on the top of a small hill of flowery gardens and forests called Barsana Hill. 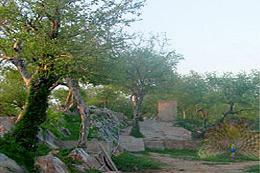 Barsana Hill is next to the Gahavarban forest which was the primary forest extending out from Barsana Hill on one side. Most days, Radha Rani would go with the Gopis to play and enjoy among the perfumed creepers and flowery secluded places of Barsana Hill and Gahvarban forest. Each day, Krishna would find them and join with them in all kinds of playful leelas. 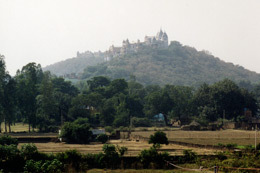 Today, In Barsana Village in India, Shreeji Temple is built on the spot where Radha Rani’s palace stood atop Barsana Hill in India (picture right). 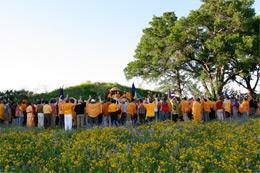 Radha Madhav Dham’s Barsana Hill looks amazingly similar to this Barsana Hill in India (picture left). This holy pond in Radha Madhav Dham, just behind the Temple and Radha Rani’s shrine (picture left), represents the original Radha Kund located between Gahvarban forest and Radha Rani’s palace on Barsana Hill (picture right). 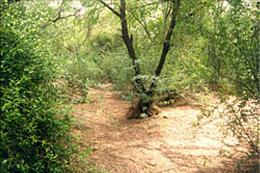 Just a short walk from her temple, Shree Radha used to come to bathe or play here with the Gopis and Krishna. Often, they would all sit together as the Gopis sang of Radha Rani’s and Krishna’s glory or they would decorate a swing and swing Radha Rani or they would dance in playful raws. During the descension period 5,000 years ago, the absolute supreme personality of God, Krishna revealed the most elevated form of Divine Bliss to Gopi Saints of Braj district in Vrindaban, India on Sharat Poornima night. On that particular night, Krishna, Radha Rani and all the Gopis danced and sang together in an elevated Divinely playful manner. This Divine act was called raas or maharas (picture right). 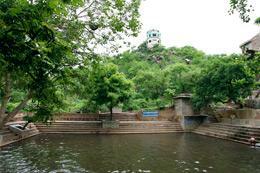 Maharas Mandal is that place where Radha Rani, along with Krishna and the Gopis do raas. At Radha Madhav Dham, the Maharas Mandal (picture left) is used for raas garba on Divali and other times as we devotionally imagine joining the raas ras with Radha Krishna and the Gopis. Next to the Maharas Mandal is the Maharas shrine, where you can have the beautiful darshan of Radha Rani, Krishna, and the eight personal aides of Radha Rani doing raws under the full moon. 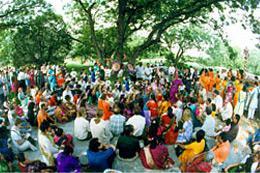 Govardhan Hill is very important, especially for bal (childhood) leelas. 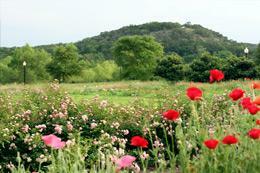 Govardhan of Braj (picture right) is a hill full of flowers and flowering plants surrounded by grazing land where all the Brajwasi boys used to come and graze the cows, and Krishna used to play. Once, Krishna held Govardhan Hill on His little finger for seven days to protect all the Brajwasis from Indra’s torrential rains. 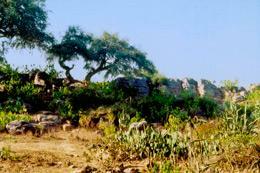 It is traditional to worship Govardhan by doing parikrama (circling the hill) while remembering Radha Krishna names and leelas as we often do at Radha Madhav Dham (picture left). 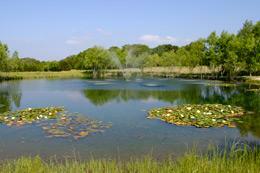 Prem Sarovar means ‘the pond of the nectar of Divine love.’ It was an important pond in Braj during the descension of Radha Krishna and is located just a short walk from Barsana village (picture right). 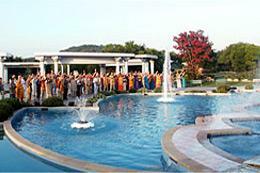 To add new charm to leelas, many times Krishna would disguise Himself and meet Radha Rani at Prem Sarovar. 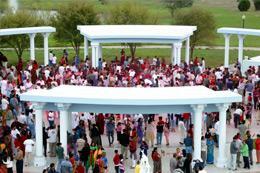 Hundreds of such leelas happened near Prem Sarovar and continue to happen at Prem Sarovar (picture left) in Radha Madhav Dham, USA. 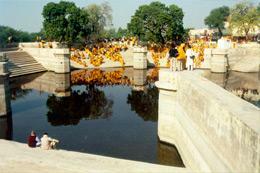 Shyam Kuti is a place in Govardhan near Kusum Sarovar. When Chaitanya Mahaprabhuji was staying in Braj, he went to many places. He stayed for quite some time, about a month or so, while visiting those places. Wherever he stayed the night, usually in the jungles since there were so few villages, he held chanting programs for His own disciples and devotees from Vrindaban who were following him. Generally these places are not known because nobody tried to pinpoint and mark them. But Shyam Kuti is a known place because the satsangs he held there were very special and all the devotees fell into a trance of Divine ecstasy during the extended chanting. 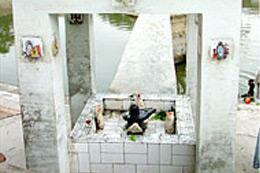 So although Shyam Kuti is not very scenic (picture right), it is a very devotional place. 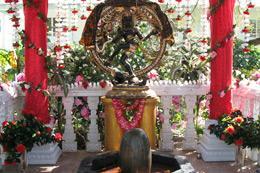 Thus we established Shyam Kuti (picture left) in Radha Madhav Dham at the base of Barsana Hill. 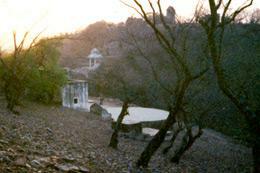 Once Radha Rani came to a place on Barsana Hill not too far from her palace, up on a hillock just above Radha Kund. There were a few Gopis with Her and the weather was fair with just a few rain clouds shading the rays of the sun – just the kind of weather peacocks like. Soon a peacock came and, delighted to find Radha Rani there, he began to dance for Her. Slowly other peacocks came until there were thousands of peacocks dancing for Shree Radha among the flowering trees and creepers. After a short time, Krishna came and watched the enchanting beauty of the whole scene, mesmerised by Radha Rani’s beauty as She enjoyed the dance. Then He thought, “Why can’t I become a peacock and dance right in front of Radha Rani?” So He became a peacock. Of course since He was the most charming and skilled of the peacocks and in His delightfully naughty way, He pushed Himself right to the front. Then He danced and danced for His Radha Rani. The place of this leela is called Mor Kuti (picture right) which we also have here in Radha Madhav Dham (picture left). Many temples and sarovars (holy ponds) in India have a Shiv mandir (picture right), however, the one established in Radha Madhav Dham (picture left) is very unique and special. When Krishna played on His flute to indicate that He was going to do maharas, Shiv and Parvati rushed to Vrindaban. When Shiv (an almighty form of the supreme God) reached Vrindaban, He was told that without the permission of Radha Rani, the Goddess of maharas, no one could enter, and besides, only a Gopi can join maharas. Then ever-Gracious Radha Rani accepted His request and He was overjoyed. He immediately converted Himself into the form of a “Gopi” (a maiden of Braj) and entered Vrindaban. In this form His name is Gopeshwar. The Gopeshwar Mahadev Shrine in Radha Madhav Dham represents Lord Shiv when He took the form of a Gopi so that He could enter maharas leela.